Home » Event » Freedom to Read – Would You Print a Banned Book? Freedom to Read – Would You Print a Banned Book? Controversy: First published in 1934 by Obelisk Press, Tropic of Cancer was banned in the United States for obscenity (graphic sexual content). U.S. Customs banned the book from being imported and sold in the United States. However, the book was frequently smuggled into the country. 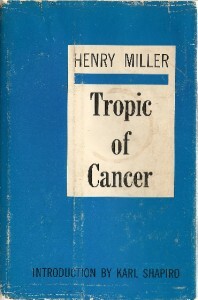 From the 1930s to the 50s, Tropic of Cancer was the subject of many lawsuits between the government and publishers/book sellers. Challenge: In 1961, Grove Press legally published Tropic of Cancer, and lawsuits, once again, were filed in 21 states against store owners that sold the book. The case against it went all the way to the U.S. Supreme Court in 1964 with the decision of it being obscene was overturned. Impact: Tropic of Cancer is considered a 20th Century literary masterpiece. Miller broke ground with a new literary writing style with his fusion of real life with fiction, free association writing, mysticism, and philosophy in the book. Many writers of the time hailed Miller as a new literary voice despite critics of the book. Beat Generation writers, Jack Kerouac, Allen Ginsberg, Williams S. Burroughs and Lawrence Ferlinghetti, claimed to be greatly influenced by Miller’s work. It has been named on several 100 Best or Must Read Book lists and was instrumental in paving the way for challenging censorship in the United States and Freedom of Speech cases. By hocopolitso in Event on September 11, 2012 .